The Florida Keys have plenty of attractions to bring travelers from all over the globe – an otherworldly highway of bridges over the sea, a massive, empty fortress on the edge of American waters, and the sea-side town of Key West at the center of it all (all of which you can learn more about in my last post here). These man-made wonders aren’t the only thing that makes the keys special. The keys are home to many different animals, all of which play a role in the systems that make this destination unique. Believe it or not, even things like poisonous plants and mosquito are essential building blocks for the nature that so enchants us. As travelers, it is our responsibility to protect and respect these living beings (except the mosquito biting you, we all have permission to kill those rude ladies with a well-aimed slap), even if it means we don’t get that selfie we’d love to have, or get to hike through a cave or island with nesting animals. Why is this our responsibility? As I mentioned before, each species plays a role in creating the environments that we travel so far to visit. If we value these places, it wouldn’t be right to leave it any lesser when we return home. Local people and future generations also deserve to have these environments and their inhabitants protected. Also, as many of us are animal lovers, and it is important to consider the consequences of anything that we do. The story of the key deer of the Florida Keys is a good example of why we must be careful, and the consequences of not doing so. The key deer has the long and illustrious scientific name Odocoileus virginianus clavium – try saying THAT three times fast. For the uninitiated, the fact that this species has three components to its scientific name, means that it is a subspecies, which is basically a group of animals that has been isolated long enough to start to look like a new species, but isn’t quite there yet. The key deer is a subspecies of the more common white-tailed deer (Odocoileus virginianus), which most Americans have seen at one time or another. Unlike the white-tailed deer, however, the key deer is found in only one place in the entire world, the Florida Keys (specifically from Little Pine Key to Sugarloaf Key), and it is easily distinguished from white-tailed deer due to its tiny size. Sadly, this special little creature has been on the brink of extinction since the 1950s, when hunting brought its population down to 50 animals. We tried to address this problem by using the Endangered Species Act to stop people from directly killing these tiny, island deer, and in 1957 the Key Deer National Wildlife Refuge was established. The hope was, as it often is, that if we gave them some room, and kept the stressors of human activity away from them, that their numbers might start to grow. And they did! For a time. The highway that makes the Florida Keys such a road trip destination isn’t innocent in this story. Since key deer have lived near ever increasing numbers of humans for decades, they have lost their fear of people and the roads that allow us to explore the keys with ease. However, even if they hadn’t lost that fear, Highway 1 cuts through their refuge, and this forces the deer to cross the road in order to find food and mates. Each crossing puts them in danger of cars that are move through the refuge, especially at night, when the deer are most active and people are the least able to make them out in time to slow down. So, altogether, this means that the popularity of Highway 1, as well as people’s mindset while they are travelling it, has created a continuing threat to the key deer (along with other issues that you can read more about here – https://www.nwf.org/News-and-Magazines/National-Wildlife/Animals/Archives/1997/Whats-Killing-the-Key-Deer.aspx). So now you’re asking, how can I be part of the solution and not the problem? Well, if you ever find yourself driving through the keys, SLOW DOWN. There are plenty of signs informing you when you are entering their refuge area, and special speed limits imposed on the highway here as well. With a population of only around 300, a single deer killed on the road is a risk for the species. If you’re passengers complain, you can tell them to Google the key deer so they can look at their cute little faces and that they really should have gone to the bathroom earlier. Travel and happiness go hand in hand for many of us, but often we don’t think about what impact we have on our journey. We should always respect the places we visit, and the people and animals that call those places home. For most, the Florida Keys is an alluring road trip destination due to the Overseas Highway, which takes drivers through the keys and over the ocean, as its name suggests. The sights and sounds of the Florida Keys may be a little bit disappointing to nature lovers when the ocean is out of sight, because human habitation here feels thick and unending. But as I always say, there is something for everyone in all destinations, and the Keys are no exception. So, fellow outdoorswomen and men, here are my top three activities for you in the Keys. Seventy miles west of Key West lay the seven small islands of the Dry Tortugas, now home to the historic Fort Jefferson on Garden Key. Fort construction began in 1846 but even after 30 years of progress, it was never completed. This massive complex was meant to help the United States control the Caribbean Sea, its strategic position is pretty clear even to the casual onlooker. The fort itself offers at least an hour or more of thorough exploration, with three levels and the sandy trail that loops around its top and base. But aside from the fort, the Dry Tortugas are also a splendid place to snorkel, and in the right season, you can get some casual hiking in as well. Mid-October to mid-January is when the beaches of Bush Key are open – a unique ecosystem and an important nesting ground for several species of marine birds. The easiest way to get out here is with the Yankee Freedom, which can either take you out for the day, or deposit you on Garden Key for some camping. Arguably, Biscayne is more part of Miami than the Florida Keys, but the main part of this Floridian wonder is the tail end of the Keys, along the shore of the mainland. There is a visitor center on the mainland, but this is really just a gateway to the keys that are part of this protected area including Adams Key, Elliot Key, and Boca Chita Key. While they are close to Key, they aren’t accessible by land, so taking a day tour with one of the companies that works with the National Park Service is necessary if you want to snorkel, kayak or hike in the park. So, we have nice nature stops at the base of the Keys, and far out to sea past Key West, but what about all those islands in the middle? Is there anything other than concrete bridges and strip malls? Well, of course! First of all, there are plenty of places to park at near the bridges where you can stop to fish or walk around. But more importantly, there are multiple state parks throughout the Keys that give you a glimpse into what these islands were like before humans started paving them. Florida Hikes has a great post about this that I referenced when driving through. You can give yourself a driving break AND support Florida’s protected areas, making checking out these parks a true travel perk. If you want to see manatees in the Florida Keys, be sure to look at MBsees Manatees! Enough Said. One of our first stops on the N500, after John O’Groats, was a place called Smoo Cave . I simply love caves (although I have not had the chance to go caving, I have visited caves in several different countries and continue to make it a priority when I travel), so based on that and my immediate love for the name, I just had to check this place out. The outer part of the cave that opens out onto the beach is a sea cave, while the inner cave, past the waterfall is a karst cavern. For the casual passerby, there is a section of Smoo that is freely available to anyone that hikes down the path that winds its way down the sea cliffs from the parking lot to the beach-front. This includes a large, stone room that is covered by a thin carpet of green, and a wooden walkway that leads back to a view of the waterfall that is the main visual prize of the location if you can’t go on the tour. Unfortunately, we didn’t do the tour ourselves, although it was very affordable, because we weren’t sure when the last group had left, and we didn’t want to wait around for a half hour for the next one. Pretty lame excuse! But we did still have a lot of driving left to do, and the weather was steadily going downhill, so we weren’t even sure that there would be another tour at that time, since rain can cause flooding in the cave. The views coming south from Smoo Cave south to Lochinver were some of my favorite from the trip, and heavens, I was sad that we weren’t prepared for a hard hike. For one, if you ever drive this way- please stop at the turn off just north of the bridge between Loch a’ Chairn Bhain and Loch Gleann Dubh. The bridge isn’t particularly artful, although it is oddly pleasing to the eye… perhaps due to the juxtaposition of the concrete structure and the towering highland mountains beyond. The Lochs are breathtaking too, and I hate to say it, but in my opinion, much more beautiful than Loch Ness, although they are much smaller and lack a prehistoric monster (as far as we know). Driving past the bridge (south) you will then get some great views of the mountains that have stuck in my mind ever since the trip- three peaked Quinag to the west and Glas Bheinn to the east. Even when we visited the Isle of Skye, there were not mountains that outmatched these for beauty and mystique, in my opinion. And regardless, they are both great examples of highland mountains, and worth a gander if you like challenging hiking. There is also some easier walks that you can check out on the way down from Lochinver to Gairloch. For instance, the Little Assynt Estate has a very nice area to walk around in with great views of a little loch and the mountains, as well as a place to sit and relax (and maybe fish as well?). The trails are dry and mostly flat here as well, so they make for a nice break from driving if you don’t have the proper equipment for a highland hike. We also walked up from Gruinard Bay to Eas Dubh Falls – which was a nice stroll along the beach, but the hike itself, up from the ocean into the hills to the waterfall, was quite boggy. Due to this, and our lack of proper, high-top hiking boots, forced us to walk through the bracken more than I would have liked, and I ended up getting a tick. So, do plan ahead, bring good, waterproof shoes, and be aware that Scotland does, in fact, have ticks. I definitely did not regret this second hike, however, as the waterfall was beautiful and the trail was deserted. If you want to see more picture of my journey through Scotland, as well as past pictures, check out my travel Tumblr here. On July 1st, I am planning on posting about the cities and castles of Scotland. Feel free to leave relevant comments and/or questions below. Native Americans as well, who left their beautiful art behind. The area is currently managed by the BLM, and while there is little more here than a fence keeping hikers away from the ancient carvings, and a dirt road to park, the Parowan Gap isn’t far from the main highway, so it is worth a stop. 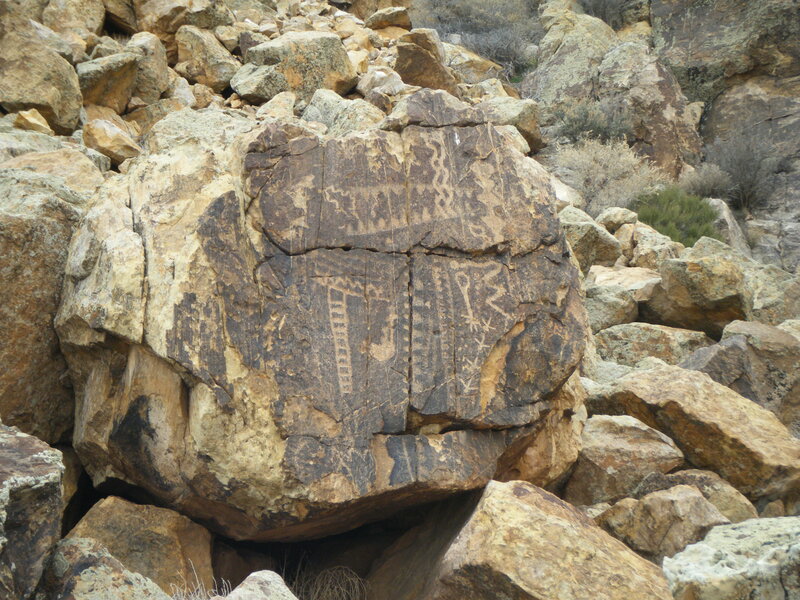 Petroglyphs are some of the most ancient art that we have, and it is always good to connect with the people of the past, and appreciate the landscapes that inspired them to create. Heading further south, past Cedar City, we ran into a small part of Zion National Park- Kolob Canyons. I’m not going to spend a lot of time discussing our visit here, because I think Zion deserves an entire post on its own, and I actually haven’t had the opportunity to visit the main section of the park. At any rate, Kolob Canyons is a great place to visit while traveling down the 15 towards Arizona. 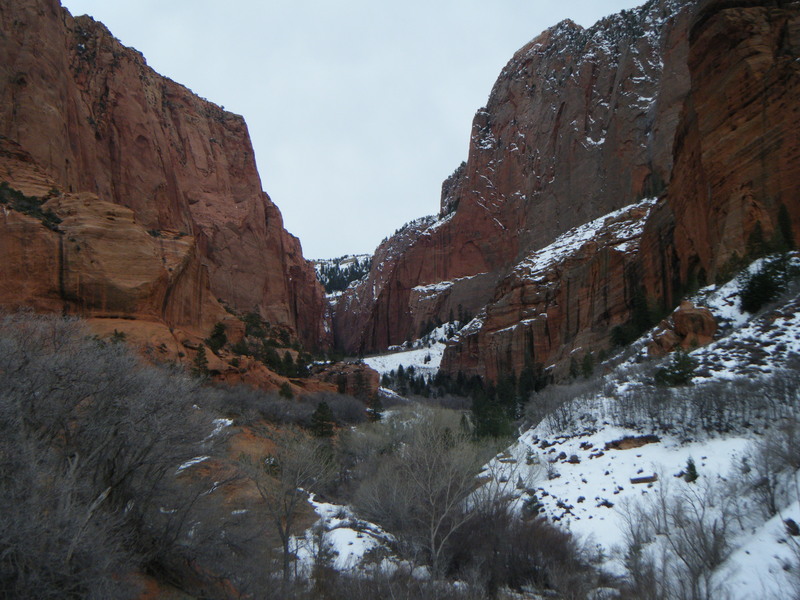 It showcases the red rock mountains that make Zion so famous, and so it is nice place to site-see and hike. Unfortunately, when I visited, there was still snow on the ground, which created a beautiful contract between the green of the sparse, ever-greens, the red of the mountain-sides, and brilliant white of the snow. However, this also meant that the trails were muddy, and hiking in my normal, light-weight Merrell Lithe Gloves was somewhat difficult in the circumstances. In better weather, and with better equipment, hiking during the early spring would have been nice. Kolob Canyons was fairly quiet when we visited, which is most likely rare during the high season. I’m a little hesitant to say it, but Zion wasn’t the highlight of this leg of our trip though. Rather, the Valley of Fire , a Nevada State Park that I had no idea existed before the Great Basin park ranger told us about it, turned out to be one of the most amazing things that we saw. In my defense though, it was declared a National Natural Landmark in 1968 (according to Wikipedia), and it has been a park since the mid 1930s, so I guess its appeal has been long-term as well. The park itself is characterized by some literally awesome sandstone formations- most of them a brilliant red in color, but the park is also home to formations of a variety of colors, which create some unbelievable vistas. myself that want to wander. 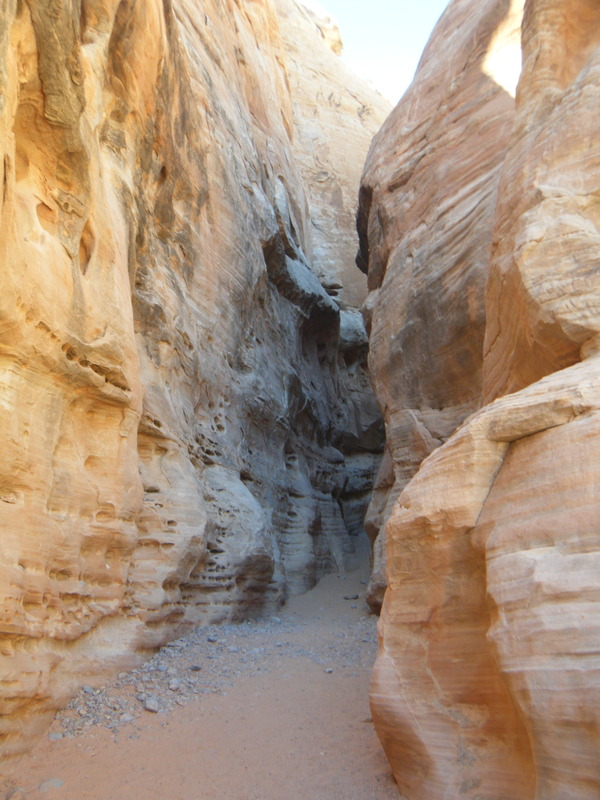 In fact, some of my favorite memories from the Valley of Fire come from the trails where you can walk though narrow canyons of sandstone or over massive waving, dunes of ancient sand deserts. There is also camping in the park, and a very nice visitor center, so overall, it is just a great place to visit, and definitely a highlight of our Nevada trip. 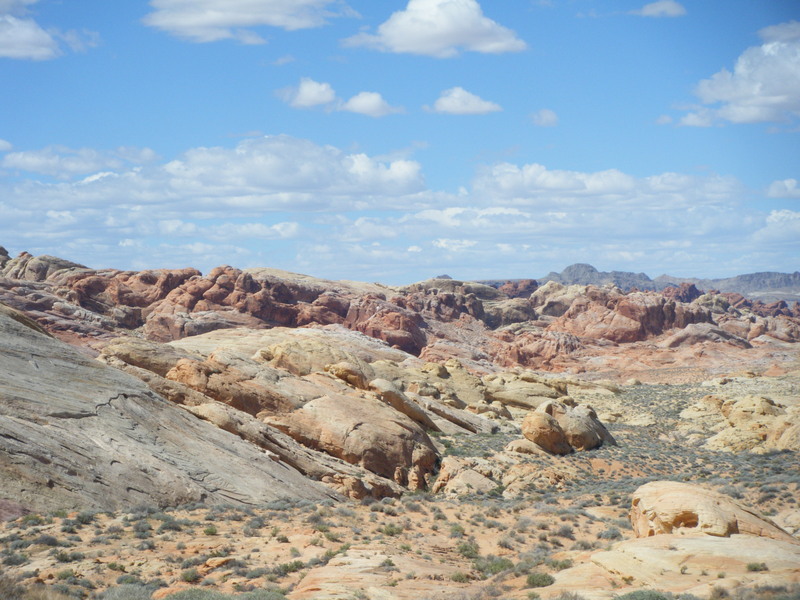 The other nice thing about the Valley of Fire is that it is right next to the Lake Mead Recreational Area, so we were able to avoid driving through Las Vegas on our way home, and enjoyed the beautiful and varied landscapes that surround the lake. I think I will be taking a break coming up, so don’t expect a post on May 1st. I have way too much going on with my graduate research right now. I have a life goal to see all of the national parks in the United States, which is easier said than done, because there are a lot of them! But so far, this has led me to visit more than a few places that I didn’t previously know existed, and I haven’t regretted any of them. 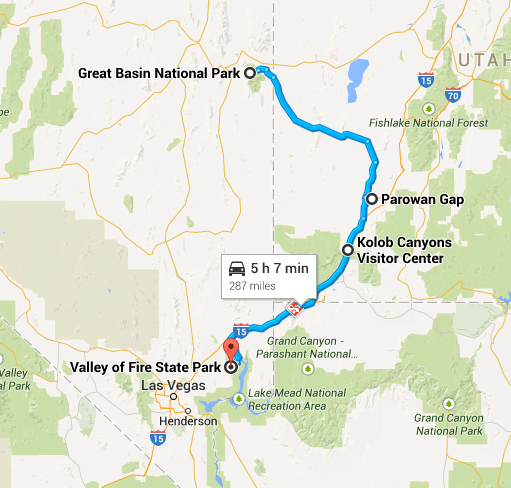 One of the national parks that I had never heard of was Great Basin, which seemed fascinating based on its name and its location north of Las Vegas in Nevada, an area that I had never explored. My dad and I were further intrigued by this place after learning that it is home to the Bristlecone Pine, one of the longest lived life forms on the planet. Finally, when we had a few days free, we decided to take a road trip up to Great Basin, and without much planning we ended up visiting several beautiful and intriguing places. The following account will mostly cover the places that we visited during this road trip, but I will also highlight a few places along the way that would be worth stopped at but which we didn’t have the time to visit. The first day of our road trip didn’t start until 15:00, so our only goal was to make it up into Nevada for our first night. Luckily, the drive between Phoenix and the Las Vegas area is pretty nice, and it would actually have several good stops along the way for travelers with a full day. 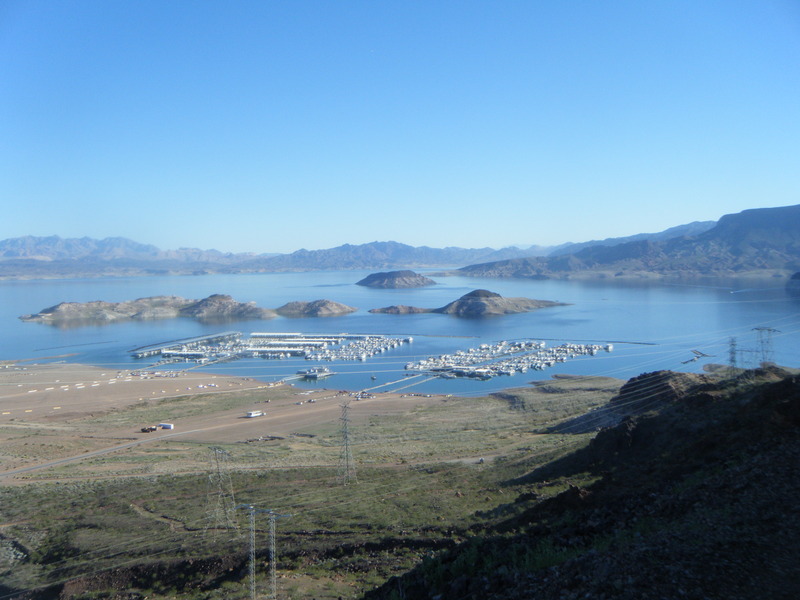 First, Lake Pleasant is worth a stop for anyone that hasn’t been, as it is a good example of Arizona’s artificial lakes, even if it isn’t one of the most beautiful. After living in the desert for a few years, it is hard to not appreciate water where-ever you find it, and besides some good desert winds for sailing, Lake Pleasant also has some nice hikes nearby in the Hells Canyon Wilderness. Furthermore, this area is home to wild burros, which I have seen on several occasions, and they are some great charismatic megafauna to see in the Sonora. Further down the road, there is also the Hassayampa River Preserve just outside of Wickenburg. I actually haven’t made it to this area before, so I don’t have any personal experience with it yet, but it is somewhere that I hope to visit in the near future. Another oasis in the desert, the river preserve protects something that is rare now in Arizona, a river still flowing in its banks, thanks to the Nature Conservancy. 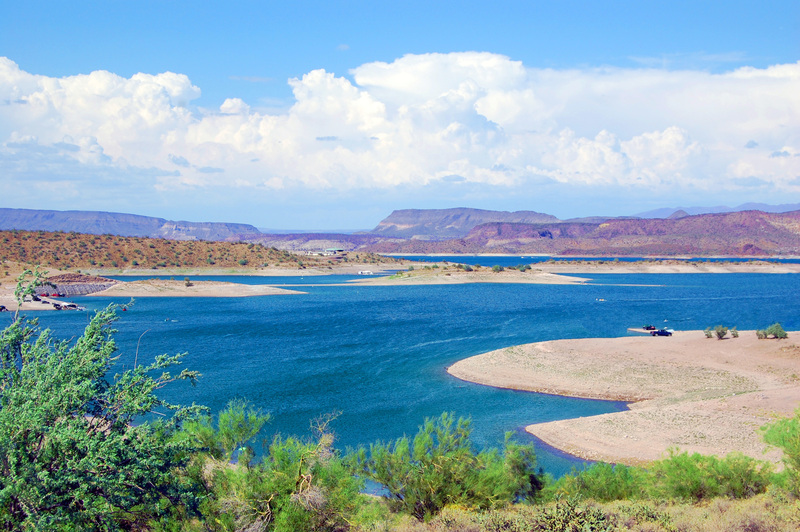 There are plenty of trails here, and like Lake Pleasant it is good to experience any water that the desert has to offer, even more so, in places where some natural riparian ecosystems remain. Of course, the biggest attraction between Phoenix and Las Vegas is the Hoover Dam, which we hit around 20:00. When I initially envisioned this trip last year, I had hoped to visit during the day and take a tour of the Dam. There is actually quite a bit there to see and do during the day, and in any case, this place is a major historical landmark for the country, and it has also shaped the Southwest in a very serious way. 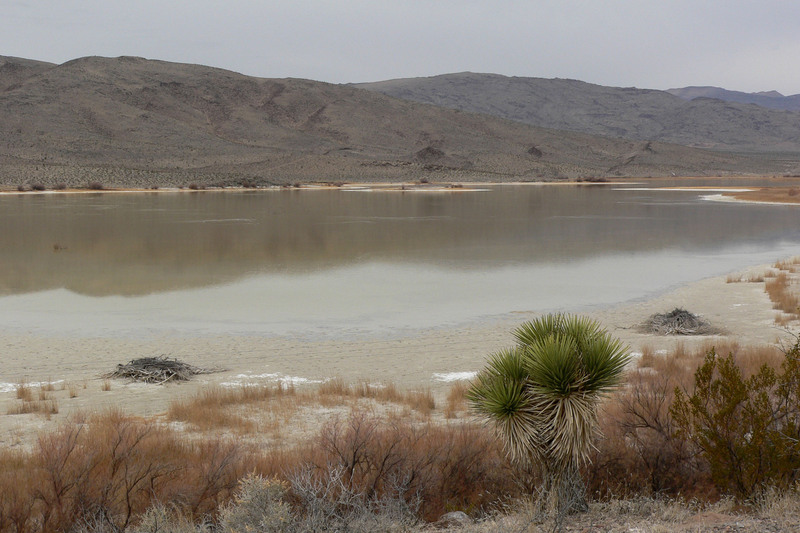 Las Vegas certainly owes its size to the resources provided by the dam, and the life-line of the Central Arizona Project shows the link between Phoenix and the Colorado River. Sadly, I didn’t get to take a tour this time around, but the dam is open to visitors until 21:00. 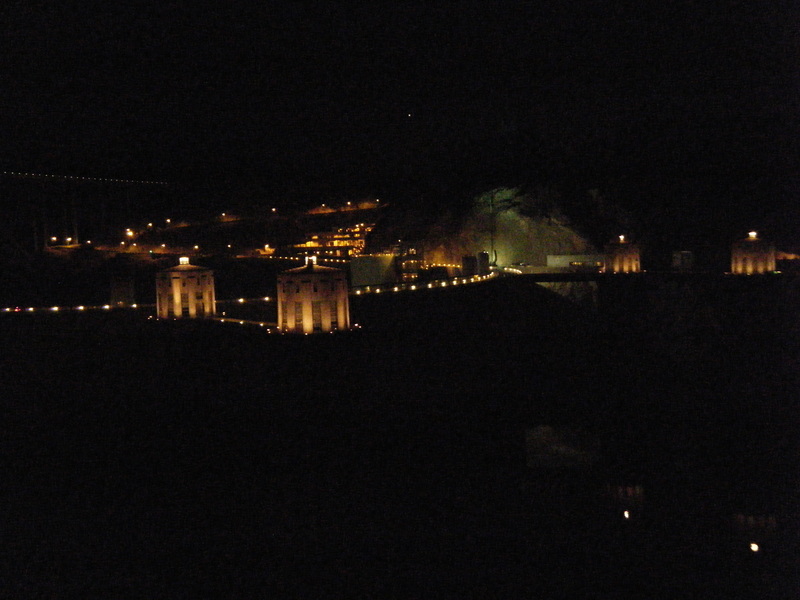 So, we at least got to drive across the dam, park and take pictures of the landmark at night. It was a very peaceful place without the crowds, and there were some good views of the stars to boot. Our day ended in Boulder City, where we spent the night in a Quality Inn a mere five minutes from Lake Mead National Recreation Area. Before we hopped in the car for the day, I dragged my dad to Lake Mead, because I had to get my national parks passport stamped and I wanted to go on a little hike before our journey. As it turned out, we found a really great little trail outside of the fee area, and we both really enjoyed this stroll. The Historic Railway Trail is right by the entrance to the park, and as its name implies, this trail follows the former track of the railroad that brought materials from Boulder City to the site of Hoover Dam as it was being built. Besides the great views of lake from the trail, we really enjoyed getting to see the massive tunnels that were built through the mountains in order to fit the large pieces of dam equipment through. From the trailhead to the first tunnel is about a mile, so it was a great section of the trail to walk when we only had a limited amount of time. 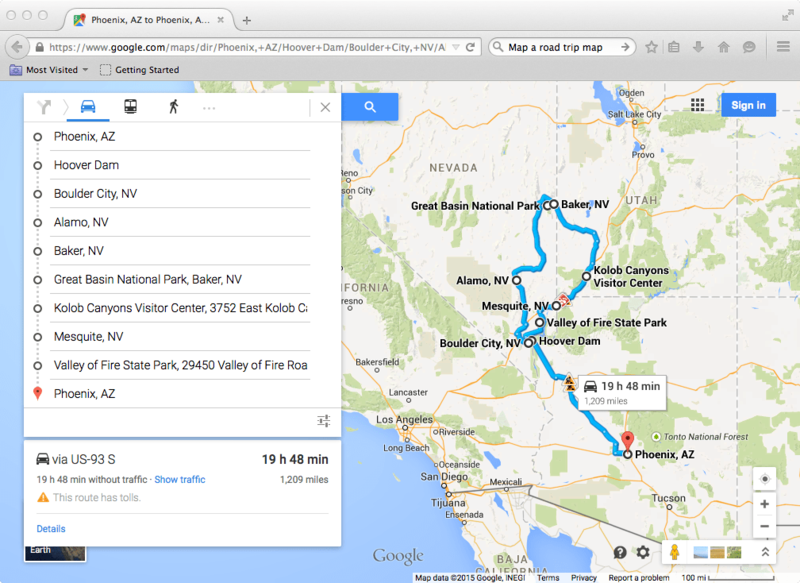 From Boulder City to Baker was quite a drive. Most of the towns that we passed, besides Las Vegas, were quite small. Alamo, which is perched just north of Pahranagat Lake, didn’t have much to offer along the side of the road, and when we asked about places to grab lunch there, the gas station attendant only told us about two different restaurants. We ended up at the Windmill just north of the town, and it was quiet enjoyable. Not only did they have some good standard American fare, but they also had a nice little bakery where we got a fresh cookie and a lemon square. From there on out, we entered the Great Basin region, which gave us a taste for what we would see and learn more about in the National Park. This region is characterized by parallel ranges of mountains, which remind me of the sky islands in Arizona, rising up out of the dry lowlands to peaks of lush forests. The lowlands, instead of being Arizona desert, however, were large, flat plains of sagebrush and grasses, where we spotted herds of cows and even a few ranchers on horseback. 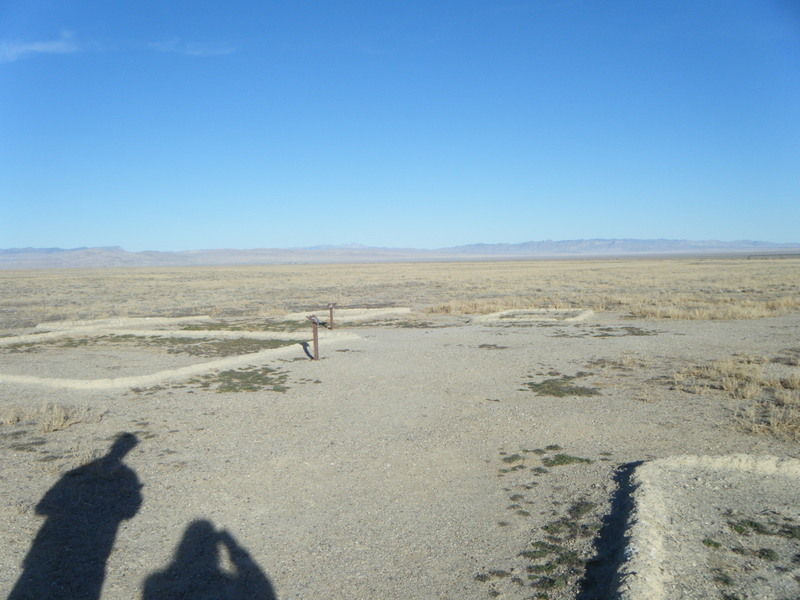 Once we got to Baker, we were somewhat surprised at how small the town at the gateway to Great Basin NP was. In fact, since we traveled to the park out of season, there were no open restaurants, and according to Wikipedia the population is 68. That being said, we had a reserved a great little place to stay for the night called the Get-Away Cabin. The owner was very friendly and welcoming, and she even bakes her guests delicious little loaves of banana bread. After getting some tips about what to do in the park the at the visitor’s center for the next day, we drove a few miles out of town to check out the Baker Archaeological Site, which wasn’t much more than a few outlines of Fremont buildings among the sagebrush. There was some good information in a little guide book that the BLM provided at the site, however. After a short stop there, we made it out to the Border Inn where we enjoyed a delicious dinner, and picked up some groceries. Day 3 and 4 to come on April 1st! And Washington DC… someday!